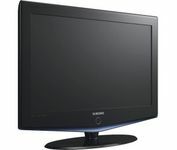 the LN-S2651D is a flat-panel LCD that combines sleek style and high definition in equal measure. Its 4000:1 dynamic contrast ratio creates an intensely color-saturated picture in crisp focus. With two HDMI inputs that allow connectivity to a wide range of digital devices, the LN-S2651D is one of the most versatile models on the market. It's nice to find an LCD HDTV that performs beautifully under almost any circumstance or configuration. The Picture is solid, clear and there's no artifacting (new verb) that I can detect, even with fast motion. Multiple video presets are already programmed if you don't want to play with fine setup. Excellent remote. The set has two HDMI inputs as well as everything else. The outer frame, in glossy black, disappears while you're watching the picture. Very well designed, and it's got a nice look just sitting there unused. My Dish remote doesn't work correctly with the Samsung's volume control. The Samsung requires multiple hits from the Dish remote to move the volume either up or down. Holding the button down does nothing. Each depression of the button causes only a small increment decrease or increase. Other than that all is fine. So far, excellent. It's been in use about three weeks, and that should cover the initial failure time. I purchased the 26 inch unit rather than the 3251 (32 inch), because my spouse didn't want the set to overwhelm the dining area. It's on a corner shelf unit, facing the dining table, and angled down the 30+ foot long dining area and kitchen. I plan to add a Yamaha ysp-800 (not yet purchased) along with a Mirage S8(already squirreled away) to boost the sound for the whole kitchen dining area. Eventually this will all be part of a whole-house system, but not yet. I live in Atlanta, and my HD is all off the air using amplified rabbit ears from Radio Shack. I have Dish, but I have yet to upgrade to their HD boxes, so when I watch satellite I'm using the S-VCR connection. This is my second HD set, the first being a Mitsubishi 52" DLP in the living room. The color's more vivid on this new set. I think buying a 1080p would have been a waste for a unit this size. The pixels would have been too small to worry about. One of our stations broadcasts in 1080i rather than 720p, and, while I can see the difference on the Mitsubishi, I can't on tnis set. Mitsubishi 52" DLP, purchased in 2005.